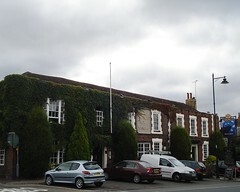 Young's pub and hotel in Chislehurst. Inside, there are two bar areas as well as a restaurant. The front bar area has high tables and chairs, while the other, accessed from the side entrance, is cosier, with a mix of seating including stools, normal upright chairs, banquettes, and a couple of very comfortable armchairs. There's a beer garden out the back too, with picnic benches and barbecue equipment. Kake and bob visited on a Sunday Bank Holiday afternoon in August 2009. We initially sat in the leftmost bar, but it was unpleasantly warm and the windows didn't appear to open, so we retreated to the beer garden. Real ales available were Young's Special and Ordinary, Bombardier, and Kew Gold. A pint of Special and a pint of Kew Gold came to £6.81. McCoy's crisps were 75p. According to a board seen outside in August 2009, quiz night is Sunday from 7pm. Accessibility: Between two and four steps up to get in at the front entrance. Can't remember about the side entrance. Last visited by Kake and bob, 30 August 2009. Opening hours taken from the Young's website, August 2009. Last edited 2013-07-04 12:02:03 (version 11; diff). List all versions. Page last edited 2013-07-04 12:02:03 (version 11).